“When I was a kid, I used to go fishing off the coast of New Hampshire and I would see codfish coming in that were bigger than me at the time. I couldn’t believe that these massive creatures were coming from the ocean,” recalls Scott Lapham, one of the two artists featured in ‘Sea Change’ A Social, Environmental & Globally Conscious Art Exhibition now on display at the Coastal Contemporary Gallery in downtown Newport, Rhode Island. A native New Englander, Lapham is known for his sculptural work and photography that explore the emotional value and historic relevance of the unseen and unappreciated people and places in the world. He brings the same appreciation to his latest bodies of work titled ‘A is for Antrhropecene,’ and ‘Perfectly Preserved Sea Shore, through which he sheds light upon how man has altered earth’s self-regulating systems and the pervasive problem of marine debris along our shorelines. Deeply moved and saddened by society’s impacts on our marine environment, Lapham laments the bygone codfish that once captivated him as a young boy. “Those fish are gone. There was such overfishing from the time that I was a kid until now that the entire school of fish is commercially depleted in the North Atlantic,” he explained to dozens of viewers at the artist reception held earlier this month. ‘Sea Change’ is on exhibit at the Coastal Contemporary Gallery through March 30th with 15 percent of proceeds benefiting Clean Ocean Access (COA) programs and initiatives. Proceeds from the exhibit help advance COA’s mission to take action today so future generations can enjoy ocean activities with a goal to eliminate marine debris, improve coastal water quality, and preserve and protect shoreline access. Scott Lapham and Joan Wyand exhibit at Coastal Contemporary Gallery. Photo credit: Robert Elias. “To advance our mission we must ensure that our community is part of the action, can witness the impact, and uses their experiences to tell the story that change is possible,” says COA executive director, Dave McLaughlin. 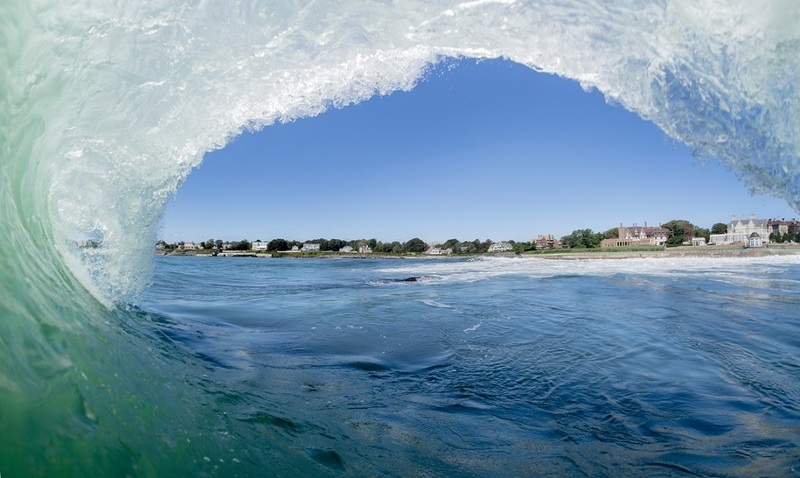 “An important part of conserving the natural resources on Aquidneck Island with a focus on ocean health, is that people have an outlet for their uncertainty and anxiousness; that is where art plays such a powerful role. The ‘Sea Change’ exhibit provides an amazing opportunity for individual curiosity to lead to an investment in our cause,” he adds. Inspiring curiosity in the next generation is something Lapham also values as an artist and a teacher. He works with youth through the Princes 2 Kings mentorship program that seeks to improve graduation rates and overall health outcomes for minority male youth. He also runs an anti-gun violence art project called ‘One Gun Gone’ that aims to take guns off the streets to create safer neighborhoods for everyone. Lapham graduated from Rhode Island School of Design (RISD) in 1990 with a BFA in photography and has since called Providence home. 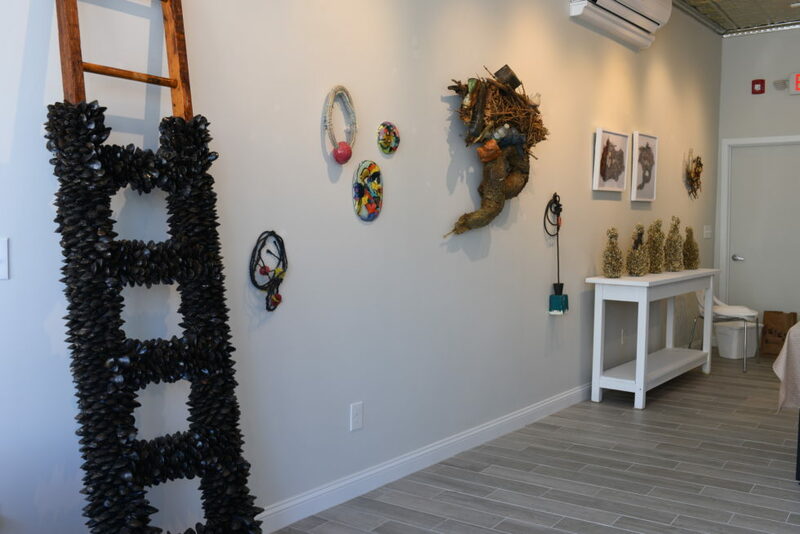 Collaboration and education are equally important to Joan Wyand’s creative process, making her artwork the perfect complement to the ‘Sea Change’ exhibit. Born and raised in Indianapolis, Wyand moved to Providence in 2001 to attend RISD, graduating with a BFA in ceramics. She is a multi-media artist and the founder of Joan Zone, an action-based learning space that cultivates wild, independent children who have the skills to communicate, collaborate and bring their ideas into reality. “I deeply value children’s foundational learning experiences. The social, emotional, and physical learning children develop from ages 2-5 impacts the adults they will become,” says Wyand whose creative mission is to inspire joy in everyday life while confronting challenging social issues and bringing an intense awareness of our material environment. “Clean Ocean Access also sees the value of engaging youth in environmental issues using art,” says Eva Touhey, program manager at COA. 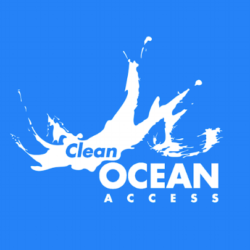 In 2018, COA organized an environmental art project with local high school students that involved using the ‘Power of Art’ to raise awareness of ocean health issues in the One Ocean Exploration Zone at the Volvo Ocean Race Newport Stopover event. “I was amazed at the students’ creativity and their deep concern for the environment and the artwork they created in just a short amount of time! It was a truly eye-opening experience for me and the students,” adds Touhey. In 2002, Wyand discovered an abandoned shoreline in East Providence that was polluted with washed-up marine debris. This strip of shoreline happened to be the same area that inspired Lapham’s sculptures, making ‘Sea Change’ an almost fated collaboration between the artistic duo. 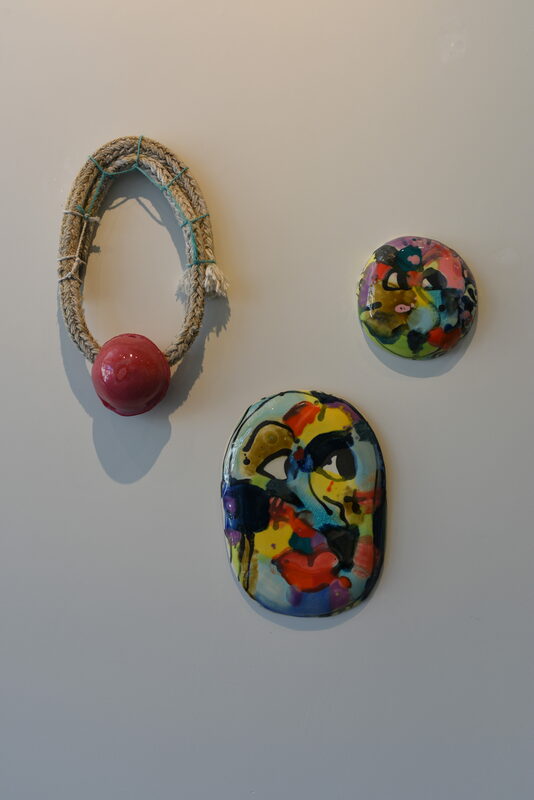 Joan Wyand’s ceramic pieces part of the ‘Sea Change’ exhibit at Coastal Contemporary Gallery. “The way the shoreline is built up with giant boulder rocks creates this perfect sieve for trash,” Wyand describes the East Providence shoreline, which she continually visits to collect marine debris for her artwork. 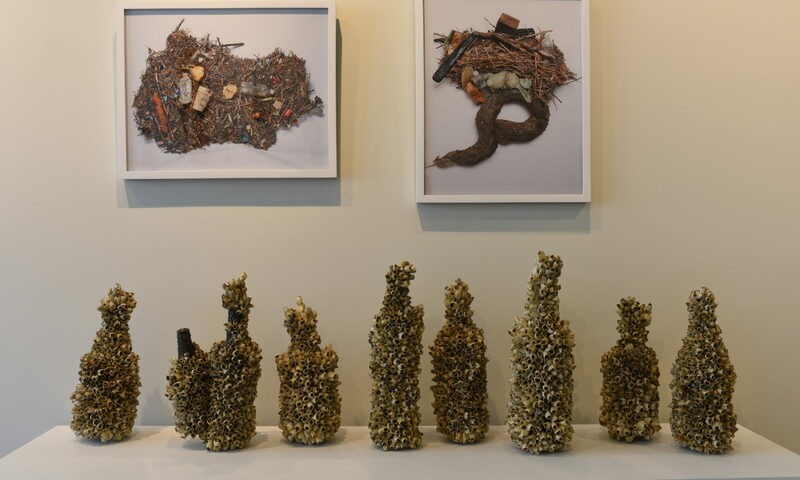 “I think the reclamation of the trash is so beautiful; it’s something that people can’t recreate—only nature can make the surfaces look that way,” she adds, inspired by nature’s resiliency to the toxic materials in the marine environment. The sculptures in Lapham’s ‘Perfectly Preserved Sea Shore’ similarly show viewers a candid sample of what comprises our natural environment these days. “These are true samples of our world with the natural organic and the man-made inorganic matter concentrated by the rain, winds and tides of our shared environment.” Lapham has once again made us see the unseen by revealing our abandoned and forgotten trash and transforming it into meditative artwork. “I try to communicate the challenges of global issues through artwork, and I will continue to do so through my relationships with people and organizations like Clean Ocean Access that are working to raise awareness in positive ways,” says Lapham. The exhibition will continue its message and collaborative spirit beyond the gallery walls affording guests an opportunity to see the artwork in different settings with even greater reach. Beginning in April, a portion of the ‘Sea Change’ exhibit will travel to COA’s office in Middletown, where the artwork will remain on display through the end of the month. Members of the public may view the exhibit at COA’s office weekdays Tuesday through Thursday between 2:00 and 4:00PM. Artwork from the ‘Sea Change’ exhibit will be available for sale while on display at COA’s office with 30 percent of proceeds benefiting COA. Though the two artists may use different creative approaches and mediums, they agree that change is possible, and it starts with individual action. “We can all do things, even if we are not incredibly powerful ourselves,” says Lapham, who himself remains optimistic about addressing the 21st century challenges of the Anthropocene. “Everyone has to be involved, whether you live by the coast or in a landlock state; it’s a material cultural shift we have to make together,” echoes Wyand. To learn more about how you can get involved check out our upcoming volunteer opportunities and how you can become a citizen scientist.